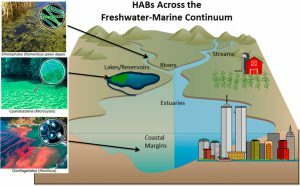 New NCCOS-sponsored research describes a paradigm shift in our understanding of the conditions that control eutrophication (nutrient overenrichment) and harmful algal blooms (HABs) across the freshwater-to marine continuum, and offers potential watershed-scale management strategies to combat the global expansion of HABs. The primary focus emphasizes the key conditions that most strongly stimulate the overgrowth of harmful algae. The combination of excessive nutrient runoff, rising temperatures, and more frequent storms and droughts are accelerating eutrophication and promoting the expansion of harmful algal blooms (HABs) across the freshwater-to-marine continuum. Within each habitat along the freshwater-to-marine continua (headwaters, streams and rivers, to lakes and reservoirs, to estuaries, and finally to the coastal ocean) the scientists highlight examples of management and mitigation techniques that have been successfully applied to reduce HAB impacts and to improve water quality. The findings present eutrophication problems as greater watershed problems driven by a variety of interconnected factors that need to be thoughtfully addressed at both local and regional spatial scales. One commonality stressed throughout is the importance of considering dual nitrogen and phosphorus reduction strategies. Coalitions and creative thinking will be needed to develop mitigation strategies that function across management boundaries and jurisdictions. The research, published in Environmental Science and Technology, stems in part from an NCCOS Monitoring and Event Response for Harmful Algal Bloom (MERHAB) project that is developing new protocols for monitoring multiple toxins and encouraging their adoption by California coastal monitoring programs to aid in better understanding and mitigating impacts from this emerging harmful algae-related threat.